Our 2 bedroom 2 bath cottage is just a few minutes walk from long sands beach. Master bedroom has a master bath and lots of space to hang your belongings. Second bedroom offers bunk beds and an additional twin mattress is available if needed. The living room area couch folds out to a full size bed and an additional air mattress may be available upon request. The master bath has a full shower and tub and the hallway bath has a shower. Enjoy the sunny open layout of the kitchen and living area before you take a short 0.2 mile walk down to Long Sands Beach! We have beach chairs at the house, linens, bath towels and kitchen basics. You may bring your own beach towels for your stay and we have a washer and dryer available for you to use. If there is anything you would like to request or inquire about please feel free to ask! Driveway parking can fit 2 cars comfortable and garage parking fits 1-2 cars depending on vehicle size. Beach, restaurants, shops, bars, York Wild Kingdom, ice cream, Nubble Lighthouse and more! My husband, Aaron and I now live in Boston with our daughter and baby number 2 on the way! Aaron grew up in a small town north of Boston and I grew up in southern NH. We both love the beach and spending time by the water and grew up doing so. We have always lived in New England and love to travel. My husband and I adore York Maine. As a kid my husband spent time here with his family and has introduced its' charm to my daughter and I. We look forward to making many memories here and hope to share our place with other families and new friends to help them create their own fun memories! 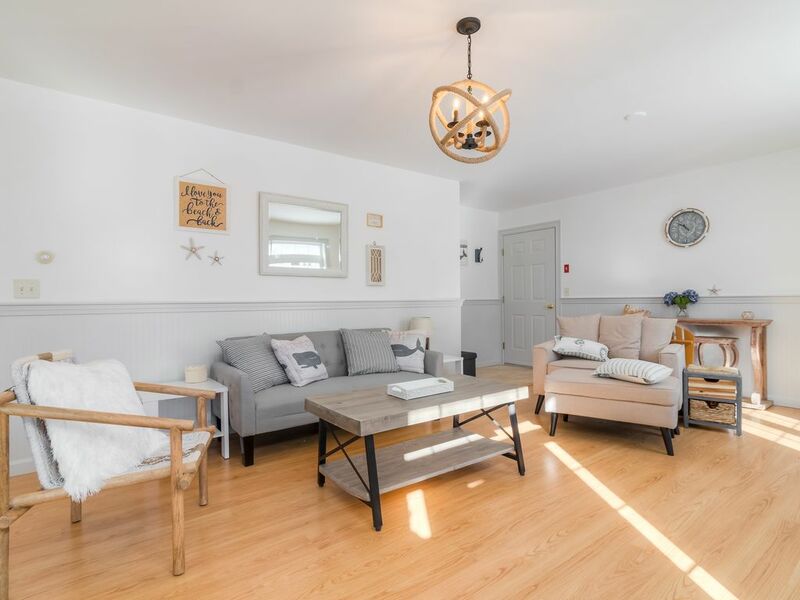 We fell in love with this adorable home, with it's front deck and the smell of the ocean nearby. The home gets a lot of nice sunlight and felt like a family could have a lot of fun here. A very short walk to the ocean, about .1-.2 miles to Long Sands! Beautiful house in a great area. The house was beautiful and very clean. Quiet neighborhood. Close to shopping and restaurants. Short walk to the beach. Lauren was quick to get back to me when I had questions. We would definitely stay here again! Lauren's place was exactly as advertised. Clean is my #1 priority and it was spotless. Convenient location too. Would stay here again. Cannot say enough about the owner!! What a super person, her communication with us was amazing. There was such flexibility at check in and check out. The house was spotless and in a great quiet neighborhood. We walked to the beach after dark in just minutes. We ate the best lobster rolls at the neighborhood grocery. Shopping in the near by town was so much fun. This IS the town for deals on lobster! Thank you for such a perfect first experience at a homeaway! We would do it again next year! Beautiful house with easy walking distance to the beach. Open floor plan. Clean and wonderful to have a washer/dryer. The five of us made lots of memories here. Beautiful home, close to everything we wanted would stay again.